Luckily, I’m poor. On Sunday evening I was at Trader Joe’s in South Pasadena shopping for groceries with my brother and he graciously offered to buy a bottle of wine. I immediately went to the delicious Marqués de Riscal rioja–easily recognizable by its Times Square bodice of gold wire mesh–but was repelled by the price of $15.99 (a low cost for a great wine, but I didn’t want to have my brother pay too much for my drinking habits). Then I caught sight of the 2004 cabernet sauvignon from Chateau Ste. Michelle. It was reasonably priced at $10.99. I decided to give Mr. Oldman a shot, though he’s from a certain university that ranks poorly in my favor at this particular moment. So far, Mr. Oldman is one for one. The cabernet is immediately drinkable from the first pour, which was a concern for me. I thought 2004 would be too recent for any cabernet (not enough time to let the tannins soften, perhaps), but hey, I’m guessing that Chateau Ste. 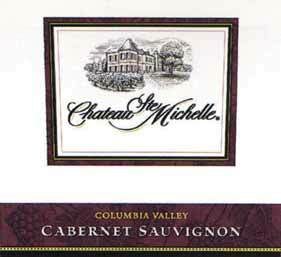 Michelle doesn’t make its entry-level cabernets for aging. But all the better. This wine was fruity–jammy, even, maybe like a zinfandel–and redolent of vanilla. More fruit than earth. Plum–prune–dark, withered fruits came to mind. (Whatever happened to the California Raisins?) The tannins were smooth; it was lighter bodied than I would have anticipated in a cab. My family loved it–even my teetotalar brother and sister (my mom sat silently in a happy quasi-alcoholic stupor). It was great with some Scharffen Berger 82% cacao dark chocolate. Which leads me to pronounce Chateau Ste. Michelle as the Sam Adams of wine: available nearly everywhere and much higher in quality than, say, the Coors Light of wine (Charles Shaw). Of course, I will have to try a few more of Chateau Ste. Michelle’s offerings to form a solid opinion, but I was very impressed nonetheless. Pick up a few bottles of the cabernet the next time you’re at Trader Joe’s! thanks for the cheap wine suggestion, I’ll definitely try it next chance I get.